Phil Thornton returned home in June after traveling through Wyoming in Thomas Lovewell’s footsteps. While it’s still possible to pick up the old prospector’s trail, the world he traveled has mostly disappeared. Only crumbling skeletal remains linger at Fort Churchill, the adobe stronghold where two Lovewell brothers served in the 3rd California Volunteer Infantry in the early 1860’s. The spot where we believe he once stood for a wet-plate photo with Daniel Chessman Oakes and John Honeywell Williams, is now a golf course. The once-bustling village of Lovewell is about three houses away from being declared a ghost town, and if a few of the buildings constructed out of the stone that gave White Rock its name are still standing - alas, they’re standing someplace else. However, Phil did send me one photographic view taken on his travels which his great-great-grandfather would have recognized instantly as Laramie, Wyoming. At the dawn of the 20th century many proud cities paid to have elaborate panoramic portraits made of their downtown districts, a technique that seemed to magnify an average-sized burg into a metropolis. Today we can achieve something close to that effect by sweeping an iPhone along the horizon and letting the brainy innards of the contraption stitch the results into a pleasing widescreen composite. 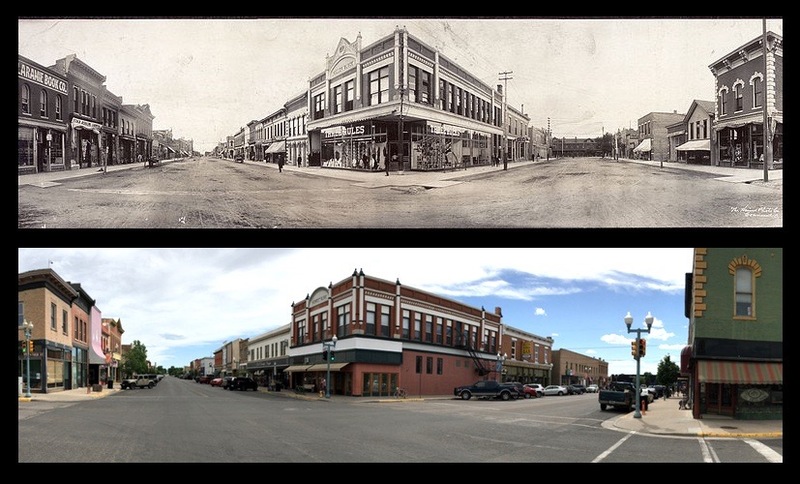 The main difference between the pictures of Laramie then and now seems to be the addition of automobiles and color photography. 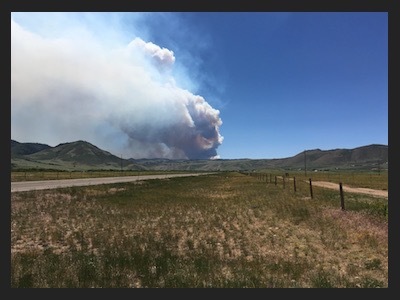 Phil would have toured the digging site at Lincoln Gulch if not for a pesky forest fire (pictured below from afar) that blocked traffic, but he did get to the Albany County Courthouse to look up mining claims. The documents he found reveal the size of the entourage from Kansas who followed Thomas Lovewell to the Hurley Mining District in 1902. Thomas’s boys Grant, Frank and Stephen were joined by two sons-in-law, Ben Stofer and Walt Poole, a nephew, Enos Robinson, and one of the men who had helped Thomas Lovewell put White Rock on the map back in the early 1870’s, A. B. Ogle. The claims are precise legal descriptions of property, including whether the perimeter was marked with stakes and string, and what the hopeful mine operator had decided to name the hidden source of riches where he now owned mineral rights. Ben Stofer, who was married to Thomas’s daughter Mary, probably captured the spirit of the group by calling his claim Wild West Lode. Walt Poole took a family approach, using his own last name and the names of his wife and mother-in-law, resulting in holdings named Poole Lode, Josephine Lode and Orel Jane Lode. Thomas, who had been at this game for forty-two years, decided not to waste creative energy, settling on Lovewell Lode and Kansas Lode. Thomas Lovewell's son Stephen wasn’t necessarily showing off any knowledge of French when he called one of his claims Golden Coeur Lode, but may have been harking back to the mineral-rich Coeur d’Alene Mountains, which had been the scene of numerous stampedes in search of gold and silver. He probably did demonstrate his grasp of scripture, however, with Ophir Lode, named for a far-off kingdom (perhaps India) which had showered wise King Solomon with gold and other precious gifts. William Frank Lovewell chose Cora Lode for his claim, probably a reference to his brother Grant Lovewell’s wife, the former Cora del Hutchens. The name may have resulted from a transfer of ownership from Grant to Frank, or perhaps a fondness for Cora’s renowned baked goods on the part of Frank, who was still a bachelor and must have paid frequent visits to Cora’s kitchen. Although Grant Lovewell’s choice, Old Hutch Lode, also might refer to Cora’s side of the family, the idea struck me that the name might have a meaning that is lost to us today. It was time for a google search. There was a Wallace Beery movie in the 30’s titled “Old Hutch,” about a man who stumbled upon $100,000 hiding in a piece of old furniture during the Great Depression. It seemed a stretch to link this with a 1902 mining claim, but I learned that the Beery film was a remake of a 1920 Will Rogers comedy, “Good Hutch.” The can was kicked a bit further down the road, but not far enough. I wondered if the term might have referred to someone famous, a name that once had been on everyone’s lips. Further serching brought the news that “Old Hutch” was the nickname of Benjamin Peters Hutchinson, a legendary speculator who got rich betting on the commodities futures market. Hutchinson had amassed a fortune estimated at between $5 million and $10 million by the late 1880’s, but lost everything when he bought high, held on too long, and was ruined by a margin call. Some of his debts were made good by his son, but Benjamin Hutchinson had to offer up his seat on the Chicago Board of Trade to clear the slate completely. Left not only flat broke but a broken man, “Old Hutch” died at a sanitarium in 1899 just after attaining his Biblical expectation of threescore and ten. In his heyday “Old Hutch” hadn’t really been that old, and while the name had lain dormant for a few years, it was resurrected in newspapers everywhere at the end of the century. By naming his claim Old Hutch Lode, was Grant Lovewell hoping for one last glimmer of the old Benjamin Hutchinson wizardry, or was he acknowledging the likelihood that, like Hutchinson’s wheeling and dealing, this whole Wyoming venture would come a cropper? Grant did finally abandon it, admitting that scouring the landscape for gold was no game for a poor man, almost the same words his father had uttered to reporters about his adventures in Alaska a few year earlier. To end on a bright note, there is A. B. Ogle’s claim, recorded nearly 70 years too early to be a reference to the Beatles’ eleventh studio album or their recording studio, and was surely named in honor of Mrs. Ogle, though it still brings a big smile to my face to write the name: Abbie Lode.